Friendly URL : Allows to define a name for the URL that’s going to be called by the application. The characters allowed in the URL are(a-z, A-Z, 0-9, -_). The Friendly URL can be informed on the initial screen of the project, where the applications are listed, on the “Friendly URL” column. Line break in title : Allows to break a link on the field titles. Horizontal Alignment : Permite definir o alinhamento da aplicação na página. Margins : Allows to organize the display of the application according to the values of the margins (Right , Left, Up and Down) in pixels. Table Width : Value of the application table. The applications generated by ScriptCase are generated in Plain HTML, and are organized in tablesm lines and cells. Table Width Unit : Measurment unit for the table width defined in the previous option, being: percentage, pixel or automatic. 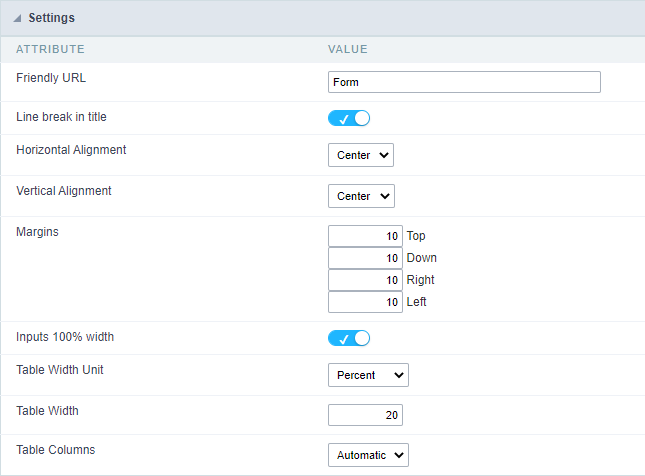 Table Columns : This parameter defines the column (fields) width of the table (application). Labels width : When the previous option is set to “Provided”, this one appears and here you can inform the width of the labels. 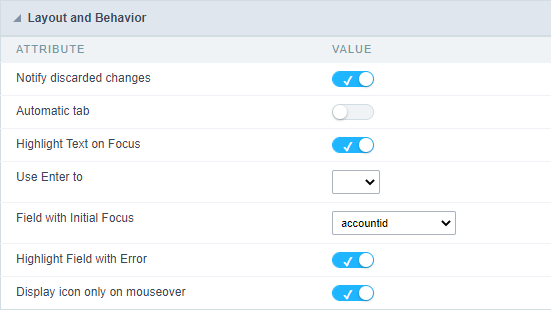 Layout and Behavior configuration Interface. Automatic tab : Changes the focus to next field when the amount of chacteres reaches its defined limit. Highlight Text on Focus : Highlights the field when selected. Use Enter to : Allows to use the “Enter” key to pass the focus to the next field. Field with Initial Focus : Determines which field will contain the initial focus when accessing the application. This option doesn’t work with fields that contain watermark. Highlight Field with Error : Focus the field with error when submitting the form. Use a template from the HTML Editor : Allows to use the TinyMCE editor. You can edit and create your own HTML Templates.